Information Technology (IT) Support is one of the most important aspects of running a successful business. Building the connection between clients and companies internally and externally is highly valued, and no other way has proven more efficient than having advanced IT support to drive efficiency. 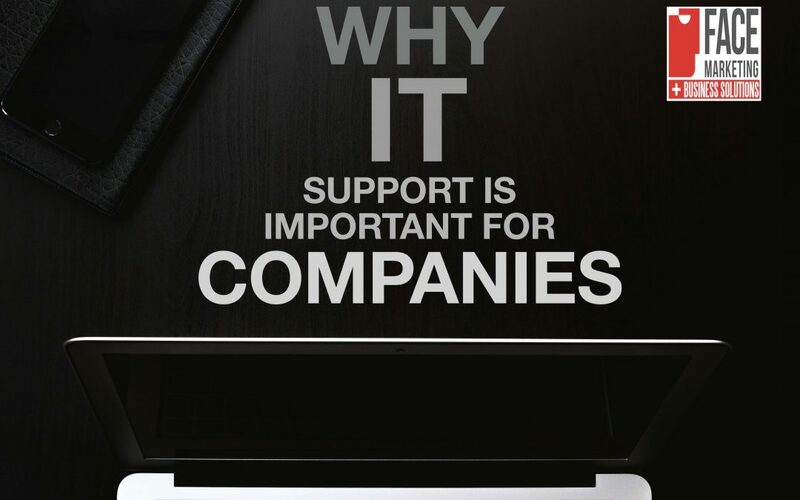 FACE Marketing and Business Solutions explores why IT support is so important for companies. In-house IT support teams are there to answer enquiries from customers and other members of staff. If there is an issue, there should be IT support. IT support, also commonly referred to as technical support is the key to helping companies maintain their efficiency with working across various technological facilities. Various agencies including marketing agencies also include technical support. IT or technical support is also referred to as the team behind a large technology corporation providing products or services for users that require instructions or assistance with the appliances. Leading telecommunications providers, broadband providers and IOT and online enterprise providers will require to have an efficient team within their business to help customers and third-party buyers with their products and accounts. IT support is usually divided into many tiers, depending on the business’ ability and aims for serving customers efficiently. Tier 0’s are usually self-help desks, wikis or online portals where customers can search for information on their challenges. Facebook, for example, provides an excellent help center that provides information to many frequently asked questions. Tier 1 technological support usually caters to basic customer service needs. Tier 1 IT support includes basic customer support queries with technical help around the following areas. Tier 1 IT support usually requires the customer services worker to discuss the issue with the customer is facing. Determining the symptoms and underlying causes of the problem. The information will then be gathered into a CRM system under the customer’s account. So the IT support team will then have a record of the customer’s activities, as the amount of IT staff taking in customer enquiries will always jump around and it is very likely that the same representative will not be in discussion with the same customer again. Tier 2 IT support usually entails the customer service representative to have more in-depth training and technological understanding of the products. These technicians usually cost more to a company and have better experience with looking to solving the problem. IT Support training can be a lengthy process, therefore companies are willing to pay for skilled and qualified staff that will be able to manage the customers and keep them happy. Tier 3 usually stretches towards higher-end IT support and requires an advanced technician to assist a customer with their challenges. Alongside with having the knowledge of solving the problem with the product, all IT support professionals need to remain professional and have the ability to overcome difficult situations. Some organisations usually have a Tier 4 level as well, though it has not still been universally adopted. As customers many times won’t understand the technical side of the causes of why their products are not working, the technicians should know how to convert the theory to more simplified instructions, so customers will understand the causes of the problems. FACE Marketing and Business Solutions has an extended service of smart tier 0 and 1 IT support for small to medium businesses. Our skilled technicians will be first into sector-specific training and product induction. This will be an intensive session of around 5 weeks. Face Marketing and Business Solutions has other extensive business support services here.